It's Tag It Tuesday with My Creative Time! The new butterfly dies from the Amazing Things set are so pretty; I just had to use a couple of them on a birthday tag! I created the tag using the Chunky Stitched Tag Dies and then used one of the More Stitched Edges Dies to make a little area for the sentiment, which is from Wow! So Many Candles. A few sequins finished off this tag! OMG Miss Katey.....WOW what a Gorfeous Tag!! That Paper is so beautiful and sure does showcases your Sweet and Precious Butterflies!! You sure did. Super Outstanding Creative job!! YOU so TOCK!! 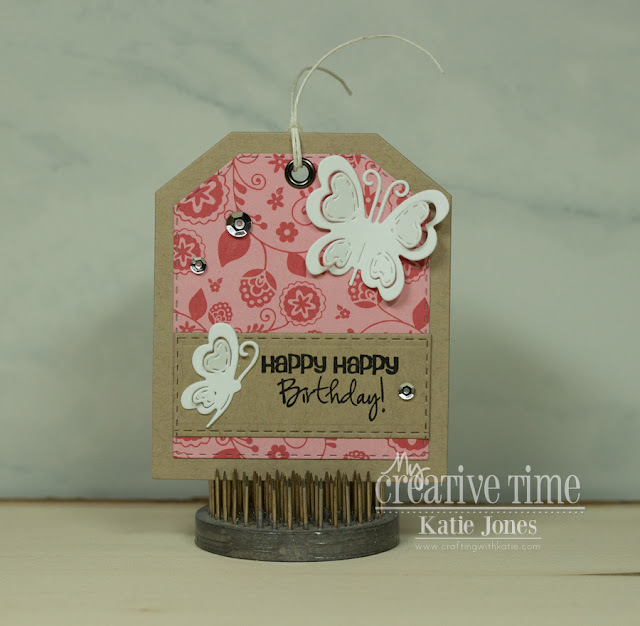 Great birthday tag...love the paper and butterflies. MCT 89th Edition Release Blog Hop & Sale!